THESE WILL BE A SMALL SIZE 1/4" - 1/2"
The Blue Tiger Shrimp with orange eyes has not been around the shrimp keeping hobby for long. The wild type of these shrimp originates from South East Asia, and has been bred into these vibrant blue colors with orange eyes. These shrimp are relativly easy to take care of. They can even be kept in water with high pH, but these are not ideal circumstances for them! As with all shrimp, it is recommended to keep a sponge filter in the aquarium to prevent potential baby shrimp from being sucked into it. These shrimp like very clean water, so no issues with this extra filtration! 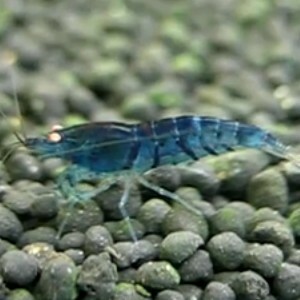 The Blue tiger shrimp will eat algae, but it is recommended to also feed some food pellets to keep them fed. Feeding is only required once per day, especially once there are baby shrimp in the tank. The blue tiger shrimp does not breed true. Its offspring will of course have the blue coloration but not all. They will all however have the orange eyes!